A mole is a small mammal with large hand-like paws and claws for digging in the ground. Moles feed on grubs and worms that live deep in the soil, so they tunnel underground to eat and make homes. Moles can dig unsightly holes in your yard, flowerbed or garden and can be tricky to get rid of. Luckily, you can get rid of moles in your yard without trapping or killing them. Plant daffodils, marigolds and mole plants in your garden. If you want to keep moles out of a small area, like a flowerbed or vegetable garden, plant daffodils, marigolds and mole plants around the perimeter of the garden. Moles dislike the smell and taste of these plants and will avoid digging near them. You can buy these plants at a warehouse hardware store lor a nursery. Place vibrating stakes in the ground. Place each stake 7,500 square feet apart, or according to the directions on your particular model. Using a trowel, dig a hole larger than the stake. Place the stake in the hole, as deep as possible, while keeping the tip of the stake above ground, according to instructions. The stakes are designed to keep moles and gophers from digging in your yard. Buy battery-powered stakes, like the Plastic Molechaser Stake, or a solar-powered stake, like the Sol-Mate Mole and Gopher Chaser, (see Resources). Vibrating stakes create an unstable environment for moles, causing them to avoid vibrating areas and choose another dwelling place. If using a battery-powered stake, make sure the screw-off top is exposed so you can replace batteries; the stake can be placed almost flush with the ground. In the case of a solar-powered stake, the solar-powered top must be completely exposed, but the rest of the apparatus can be placed in the ground. Pack excess dirt around the stake until it is firmly packed into the ground. Water your yard more often and increase how long you do so. Moles will typically dig lower if the ground is too wet. This way, instead of the moles causing gaping holes in the middle of your garden, they'll dig deeper and hopefully leave your garden alone. Get rid of the food source. Moles eat grubs and worms, who need moisture to survive. Sprinkling cornmeal on top of your grass and soil will cause worms to bury deeper down into the ground, making it more difficult for moles to find food. Without a food source, moles eventually will move on to another lawn. Stuff dryer sheets inside any mole holes you see. Most dryer sheets contain the scent oleander, which moles don't like. (Check the ingredients on the box before purchasing.) Fill the hole back up with dirt after forcing the dryer sheet inside. Pour used cat litter in mole holes. Use a trowel to pour used cat litter inside the mole's tunnels. The mole will smell the waste of its natural enemy and tunnel elsewhere. Repeat once a week to keep the strong scent of cat waste present in the tunnels. Consult a professional. If you can't remove moles from your yard with home remedies, consult an exterminator or lawn care professional to set mole traps. There are humane traps on the market that do not harm the moles. 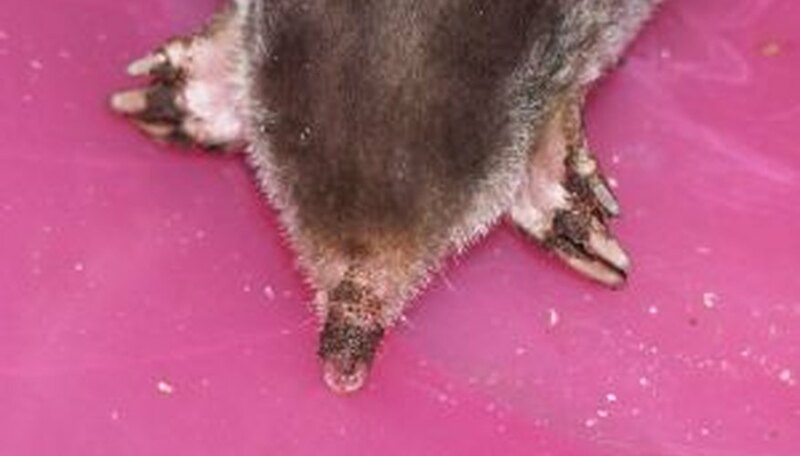 Although it is an old wives' tale, moles do not eat plant roots. Do not hammer or pound a vibrating stake into the ground.